Excluded: Muscle pain caused by too much exercise or work (overuse). Covered in Arm Pain. Fractures. Fractures are broken bones. A broken collarbone is the most common broken bone in children. It's easy to notice because the collar bone is tender to touch. Also, the child cannot raise the arm upward. Dislocations. This happens when a bone is pulled out of a joint. A dislocated elbow is the most common type of this injury in kids. It's caused by an adult quickly pulling or lifting a child by the arm. Mainly seen in 1 to 4 year olds. It's also easy to spot. The child will hold his arm as if it were in a sling. He will keep the elbow bent and the palm of the hand down. Sprains. Sprains are stretches and tears of ligaments. Strains. Strains are stretches and tears of muscles (such as a pulled muscle). Muscle Overuse. Muscle pain can occur without an injury. There is no fall or direct blow. Muscle overuse is from hard work or sports (such as a sore shoulder). Skin Injury. Examples are a cut, scratch, scrape or bruise. All are common with arm injuries. During sports, muscles and bones get bruised. Another choice is an ibuprofen product (such as Advil). Ibuprofen works well for this type of pain. Use direct pressure to stop any bleeding. Do this for 10 minutes or until bleeding stops. Use an antibiotic ointment (such as Polysporin). No prescription is needed. Then, cover it with a bandage. Change daily. Reason: Helps the pain and helps stop any bleeding. 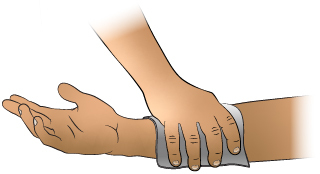 Rest the injured arm as much as possible for 48 hours. Pain and swelling most often peak on day 2 or 3. Swelling should be gone by 7 days. Pain may take 2 weeks to fully go away. To put on a sling you first need to have a triangular bandage. Many first aid kits have a triangular bandage. Find the two ends of the triangle that are farthest apart. These are the ends that you will tie around the neck. Lay the arm down the middle of the triangle. Take the two ends of the triangle that are farthest apart and tie them behind the neck. (a square knot is best, but any knot will do). 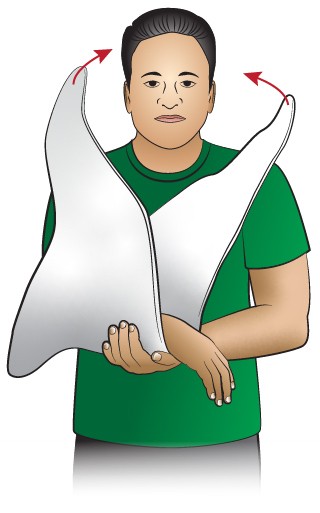 Immobilize the hand and wrist by placing them on a rigid splint (see drawing). Tie several cloth strips around hand/wrist to keep the splint in place. You can use a roll of gauze or tape instead of cloth strips. 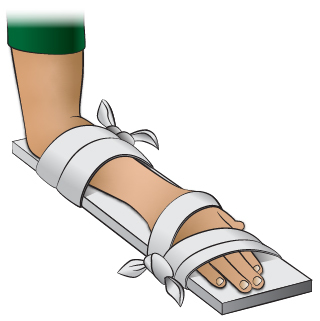 You can make a splint from: a wooden board, magazine folded in half, folded-up newspaper, cardboard, or a pillow. 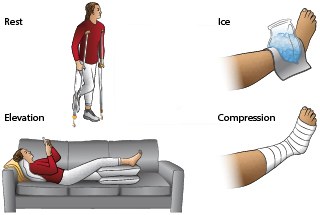 If you have no splinting materials, then support the injured arm by resting it on a pillow or folded up blanket. After putting on the splint, apply a cold pack or an ice pack (wrapped in a towel) to the area. REST the injured part of your body for 24 hours. Can return to normal activity after 24 hours of rest if the activity does not cause severe pain. Apply a cold pack or an ICE bag (wrapped in a moist towel) to the area for 20 minutes. Repeat in 1 hour, then every 4 hours while awake. Apply COMPRESSION by wrapping the injured part with a snug, elastic bandage for 48 hours. If numbness, tingling, or increased pain occurs in the injured part, the bandage may be too tight. Loosen the bandage wrap. Keep the injured part of the body ELEVATED and at rest for 24 hours. For example, for an injured ankle, place that leg up on a pillow and stay off the feet as much as possible.